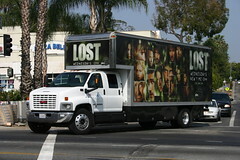 After last Wednesday’s season finale of “Lost”, diehard fans quickly discovered which L.A. Times appeared in the episode as being from the April 5, 2007 edition. The TV show’s art department had used that issue to place an article character Jack Shepherd (played by Matthew Fox) finds about the apparent death and funeral notice of an unknown (to the viewer) character. “Lost” fans were able to place the issue by tracking down a headline that ran along the other article, reading “Residents speak out about proposed coastal gas plant.” Word spread quickly across assorted “Lost” fan sites, and according to a commenter at “Lost Easter Eggs”, the traffic catapulted the article to be LA Times.com’s “most viewed” and “most emailed” article last Thursday. Now the question is whether or not the producers deliberately chose that particular issue of the Times to tip off viewers as to the date of the scene in which it appeared, or if it just happened to be a random copy of the Times that the art department had used to mock up. One possible clue that gives weight to the former theory is that shortly after reading the paper, Jack Shepherd is seen listening to a Nirvana song in his car. The connection? The anniversary of Kurt Cobain’s suicide is April 5th… the same date as the aforementioned newspaper. Correction: I originally wrote that the date of the article and Cobain’s death were in February, instead of April. Um, the anniversary of Kurt Cobain’s suicide is April 5.